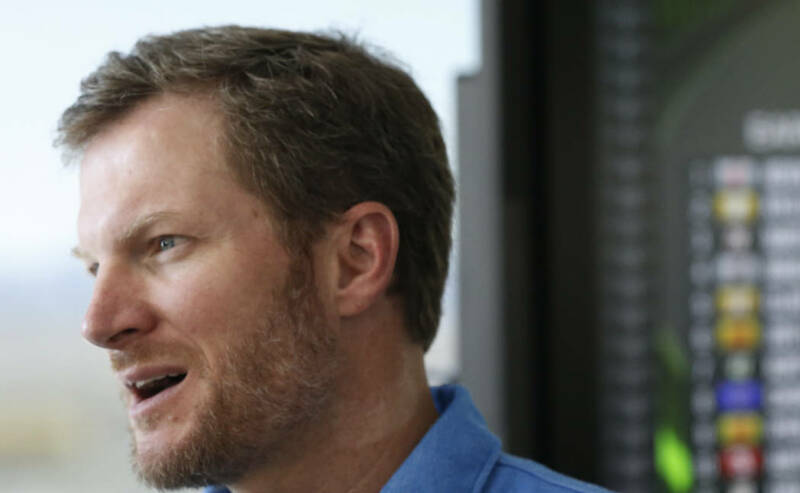 There was no master plan, no call from the NASCAR hauler for Dale Earnhardt Jr. to make a smooth transition to the broadcast booth and ease into retirement the way he would ease into the lead at Daytona Speedway. You know that axiom about a picture being worth a thousand words? Not true in every case. A couple of years ago, Dale Earnhardt Jr., then and perhaps evermore NASCAR’s Most Popular Driver, sat out a rain delay at Las Vegas Motor Speedway not in the comfort of his infield motor coach like the other drivers but in the media center instead. This is something you’d never see at a ballgame. Not even Mike Trout, as good a guy as he is, visits the press box to chill with the beat guys during a rain delay. It seemed so unusual to see Earnhardt in the media center when his presence wasn’t mandated by NASCAR that auto racing reporters who didn’t know him as well as those who travel the circuit snapped photos on their cellphones. He was shown one of those pictures Friday at Las Vegas Motor Speedway, where he was preparing for Sunday’s South Point 400 at Las Vegas Motor Speedway in the NBCSN broadcast nerve center atop the Turn 1 grandstand. His expression said no big deal. Considering the disconnect between today’s superstars and those who report on them, it might have spoken volumes about his character. 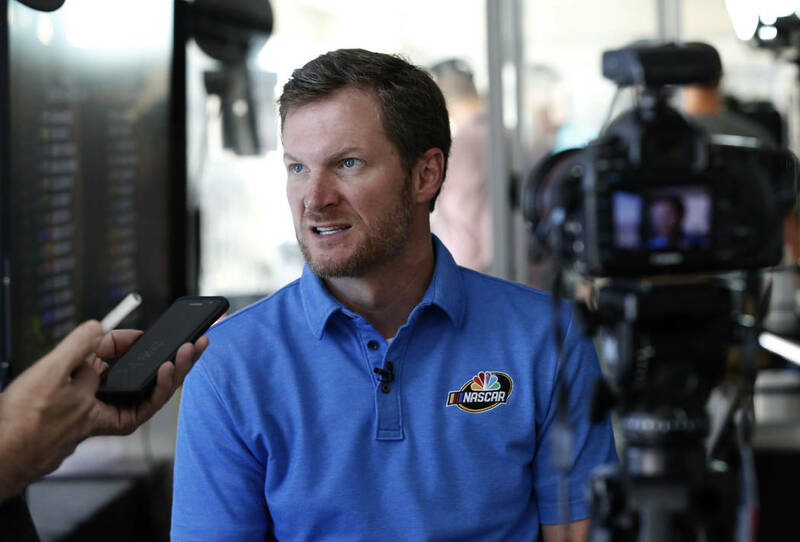 Dale Earnhardt Jr., clad in a blue NBC Sports polo and a few days’ stubble, spoke only 10 words. “I mean, I got a lot of friends in there,” the 43-year-old said. Despite what it seems, there was no master plan, no call from the NASCAR hauler for Dale Earnhardt Jr. to make a smooth transition to the broadcast booth and ease into retirement the way he would ease into the lead at Daytona Speedway. Reviews for his work with “NASCAR on NBC” have been overwhelmingly positive. “I didn’t have a plan. Didn’t know when or if I could retire,” Earnhardt said. A blow to the head in 2016, or at least the cumulative effect of a series of concussions Earnhardt mostly kept to himself, hastened the process. “I had a couple of chances to go inside the broadcast booth when I was out of the car in 2016 and loved it a lot,” said the two-time Daytona 500 champion and winner of 26 Cup Series races over a celebrated 19-year career. “That started the conversations of me doing that. “NBC is going to put me in places like where they sent us to the Super Bowl and they sent us to the Olympics in South Korea. There’s the Indy 500 next year that NBC is going to be covering; there’s the Kentucky Derby; there’s all kind of things that I’m sure they’re going to send me to — can’t get to ’em (when you’re driving), or never would even if you planned to. That’s going to be so much fun. While the switch to the broadcast booth was the most dramatic public change in Earnhardt’s life since he left Las Vegas after last year’s Champion’s Week celebration, it was not the most life-changing. On April 30, when he normally would have been seeking a drafting partner at Talladega Superspeedway, Earnhardt’s wife, Amy, gave birth to a girl named Isla Rose. Dale Earnhardt Jr. was a daddy, and as joyful an occasion as that was, it wasn’t part of the master retirement plan, either. “Being a dad is great. Every day there’s something new,” he said with a soft smile and twinkling blue eyes. “It’s fun to be around for that. It’s a blast watching her grow up. One of those: The prospect of sitting on a pit box for 30 years watching Isla Rose drive a race car. Which Dale Jr. and Amy don’t anticipate doing, Danica Patrick’s influence notwithstanding. 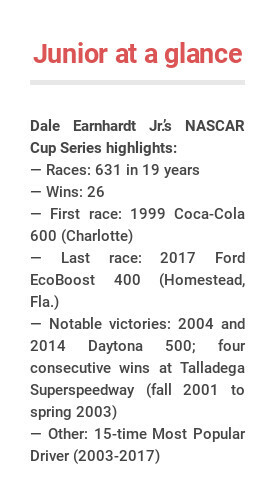 Earnhardt, who in 2004 authored one of NASCAR’s most heartwarming victories, winning the Daytona 500 three years after his father was killed on the same track and six years to the day since Dale Sr. claimed his only Daytona 500 triumph, also has become an author in the literal sense since stepping out of the No. 88 Hendrick Motorsports Chevy at the end of 2017. “Racing to the Finish: My Story” already is a best-seller, though it won’t be out until October. It’s mostly about the 2016 concussion, and the other concussions — he says as many as 20. He was so concerned about his health that he kept secret notes about the symptoms and how they affected him … just in case. You know how in NASCAR when drivers who have a history on the track meet away from it to confront issues and move forward? Earnhardt indicated writing the book was 10 times more cathartic. Next week at Richmond Raceway, NASCAR’s 15-time most popular driver no doubt will receive write-in votes for the same honor when he returns to the track to drive in the Xfinity Series. Earnhardt said it’s only to fulfill a contract he made with longtime sponsors before he suddenly retired. The sentence ran on and on, like the backstretch at Pocono. Final time in a race car? Junior said he didn’t know. But it didn’t sound like he was through checking that the steering wheel was in the right place. “I think there might be another race next year,” he admitted, mentioning Atlanta, one of his favorite tracks, and that zipping around venerable Darlington Raceway one more time would be a hoot for an old-school guy like himself. It won’t be the high-speed, peril-fraught ovals at Daytona or Talladega, his success on them notwithstanding. “Oh, no!” Dale Earnhardt Jr. said with a howl that was louder than the racing engines. Although he never won in Las Vegas in 24 starts (0-for-18 in the Cup Series, 0-for-6 in Xfinity) Earnhardt said the 1998 Xfinity Series race at LVMS was a seminal moment in his high-speed apprenticeship. He battled hard-nosed veteran Jimmy Spencer tooth and nail en route to a second-place finish that was as satisfying as it was confidence building for a 23-year-old neophyte. It came two weeks after he wound up on his roof at Daytona and another terrible result at Rockingham Speedway. People who were there remember his old man embracing him afterward. They said you could tell Dale Earnhardt Sr. was proud of his boy. Ron Kantowski at rkantowski@reviewjournal.com or 702-383-0352. Follow @ronkantowski on Twitter.